Fruit Frenzy has all your favourite fruity friends (bananas, strawberries, watermelons, etc.) mixed up into a winning combination! Get your recommended daily allowance of fruit and fun with this exciting 25 line slot game. Fruit Frenzy gives players the chance to bet as little as one cent or as much as one hundred and twenty five dollars. Be sure to keep an eye out for the very dashing wildcard Mr. Pineapple as well as the Fruit Frenzy scatter symbol. If you want to play through a specific number of rounds automatically then choose the "Autoplay" function. Get Your Daily Dose of Fun. Play Fruit Frenzy for a Chance at Luck! 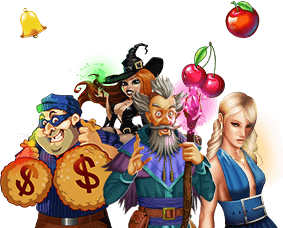 The fantastic Fruit Frenzy online Slots bring all your favorite circus characters and juicy fruits together on one platform. This online Slot has blended the most delicious fruits with all the entertainers from the circus world, to introduce you to the most unusual gambling experience. Banana ring master, orange clown and pear belle dancer join hands to provide you the virtual thrill of a circus. Mr. Pineapple conveniently replaces all the other icons in the game, except the scatter symbols to get you mouth-watering winning combos. First settle the desired wagering amount for every pay line on each spin. This can vary from a penny, two cents, a nickel, a quarter and fifty cents to a dollar or five dollars bet. If you run out of funds, the game will end on its own under the auto-play. If you're not completely sure about how the Autoplay function works, make sure to play this and many other free slots at our Instant Play section. Pin the line button for selecting the number of lines you want to play on. Make it a point to follow the sequence of the 20 pay lines on the reel, while picking up the desired number of lines you wish to gamble on. For instance, you cannot play on the pay lines in the order of 3, 17, 2 or 14. Instead you can select the pay lines in progression from 1, 2, 3, 4, or so on. The most essential tip for efficient gambling on this online Slot is to have a high performance battery on your computers. It will speed up your game-play by great degrees which will quickly lead you the highest level in the game to reap the top-most rewards. Try to reveal the combos of three similar icons on the active reels. Once you have gathered a decent number, try to get four or five like-symbols on the reels with the higher rewards tagged. Concentrate more on pineapple, strawberry, orange and pears for better rewards. Take the help from images of pineapple (wild symbol) and fruit and frenzy (scatter logos), to get some juicy combinations, free spins and multiple rewards. Payline: The term payline is used to denote the amount of lines across the screen on a slot machine. Free Spins: Free spins are the free games that can be won by satiating certain preset requirements. Will symbol: The wild symbol in the Fruit Frenzy online casino Slot is the image of a pineapple, as a circus trainer. If you spin two, three, four or five pineapple symbols on the reel, you can grab 10, 200, 2,000 or 10,000 coins respectively. Scatter symbol: The two logos, the fruit and the frenzy are the two scatter icons in the Fruit Frenzy online casino Slot. Getting two or more of any of these two symbols, anywhere across the active reels, will reap multiple values of your triggering bet.